Catastrophe bonds, also known as “Cat bonds,” are designed to spread risk. In 1992, Hurricane Andrew caused damage totaling nearly $25 billion. 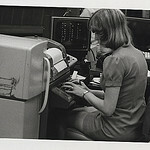 The insurance companies were staggered by the huge cost. Since then, people have started to pay attention to the cost of natural disasters, such as storms and earthquakes, that can cause huge losses of property and life. 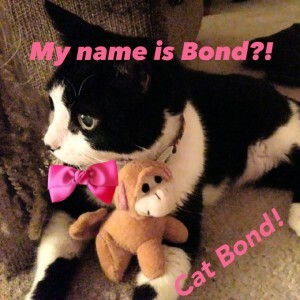 Therefore, the cat bond has emerged as a way to spread risk and loss as a conditional payment to the bondholders. The condition is the bondholders will not be payed if the catastrophe occurs; but if nothing occurs, the insurer will return the principal plus the interest. Normally, the cat bond interest is higher than the market rate of return of other bonds. Traditionally, insurance companies cover storms, earthquakes and other natural disasters. They try to transfer risk through reinsurance. Reinsurance companies often negotiate with insurance companies to set a deductible agreement, and the reinsurance company will pay the amount exceeding the deductible. The bus, subway, railroads, area bridges and tunnels are like the blood vessels and arteries of the greater New York area, and Grand Central Terminal is the heart of the entire transportation system. 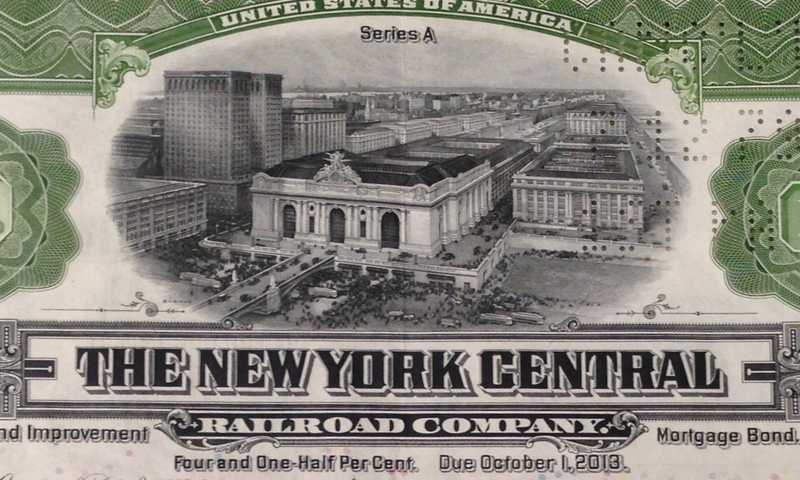 The Museum of American Finance has within its collections a $1,000 New York Central Railway Company 4 1/2% bond that also served New York’s transportation system over 100 years ago. This bond was issued in 1952 by the New York Central Railway Company, founded in 1852. 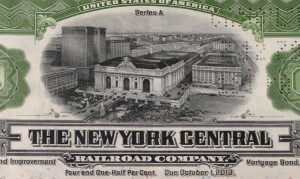 The American Banknote Company printed it, and the vignette is an engraving of Grand Central Station. Interestingly, the due date of this mortgage bond is October 2013! 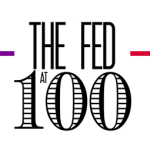 Coincidentally, at about the same time an historical bond centered around the New York transportation system is coming due, a new type of bond for the transportation system has become necessary.